Mathomatic is a portable, general-purpose computer algebra system (CAS) that can solve, differentiate, simplify, combine, and compare algebraic equations, perform standard, complex number, and polynomial arithmetic, etc. It does some calculus and is very easy to compile, learn, and use. 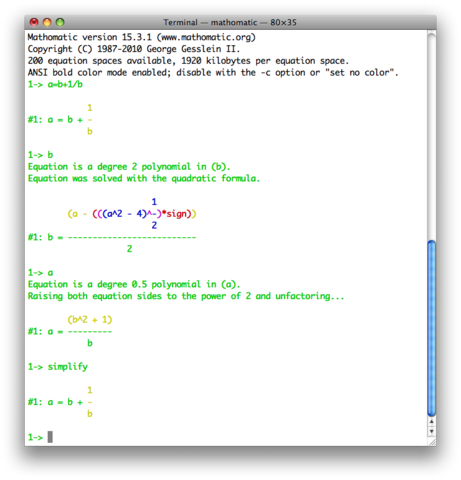 The symbolic math application with a simple command-line interface is designed to be a colorful algebra calculator that is reliable, responsive, convenient, and comfortable to use. The symbolic math library is lightweight and easy to include in other software, due to being written entirely in C with no additional dependencies.